I'm so excited that Thanksgiving is over, and now it is "officially" Christmas time! I love, love, LOVE the holiday season, and I especially love giving gifts that are sure to put a smile on someone's face. When it comes to my boys, I could pick out 200 gifts each for them that I know they are sure to love, but sometimes, I have a hard time choosing gifts for other people. My best friend, especially! We have been friends since high school, but I still have a hard time choosing just the perfect gift for her every year! 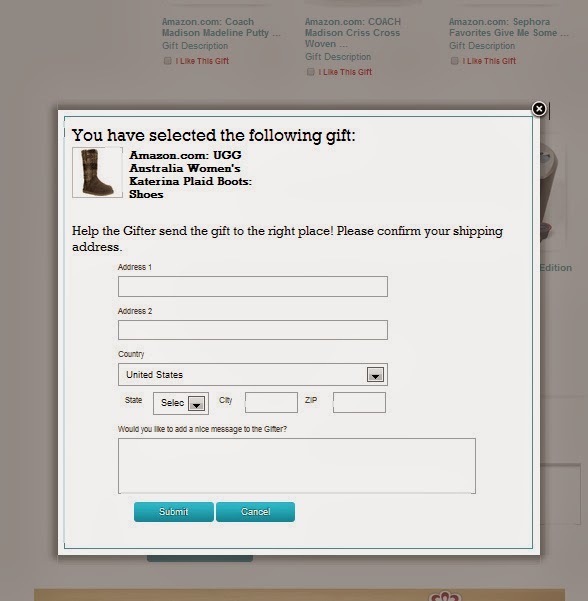 It causes me sooo much stress!I hate giving gift cards though, they just seem so impersonal. However, I think I might have found the answer to my holiday gifting dilemmas! 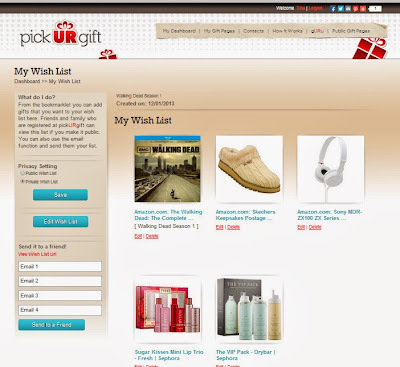 Have you ever heard of pickUrgift.com? It is an awesome website that makes gift giving absolutely 100 percent easier! The idea is simple! You can browse the internet, and find potential gifts for that really hard to buy for person on your list. You save the potential gifts to a wishlist, which is sort of like a bookmarking tool for your browser. (If you are familiar with the Pinterest toolbar and button, it actually works a lot like that, it's super easy!) Then, once you have a collection of potential gifts to choose from, that's where it gets really interesting! You can then send the wishlist TO the recipient and have them choose the gifts they like best from your choices! It's SO easy, and it takes all of the stress out of gift buying! If your recipient already has that gift, they can let you know so you don't waste your time and money on it! If your recipient would prefer a certain gift from your wishlist, they can let you know which one they like best! It really is a win/win for everyone! No stress that you will be giving the wrong gift, no worrying about regifting or returns, and the recipient also knows that they are not going to be getting a crummy gift that they won't like at all! I have never really heard of this Reverse Wishlist concept before, but I have to say that I think it's a great idea, and I really like it! I think it is going to really change the way I handle my holiday shopping! Your recipients aren't REALLY picking their gifts, but they are having a sort of say so in them, which still leaves them surprised and leaves the gift giver with considerably less stress! SO NICE! What I really love about this is that I don't have to feel pressured to add all of my gifts in one day! 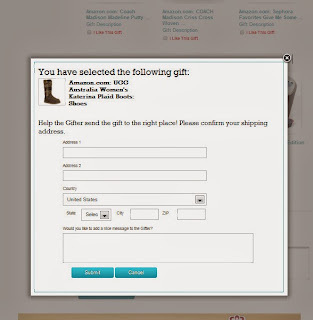 If I am just browsing the internet, and see a great gift idea, I can add it at any time! Wanna see how it works? Check it out! Now, you can create a gift page for anyone on your list. Once you have found a (possible!) perfect gift for your gift recipient, you just click the UR button on your bookmarks bar, and you can add any gift to your wishlist! Now, all I have to do is pick one that I would like a lot, and then go right to the page where the gift can be purchased- how great is that!? That way, you can check the product out and see if it is really something that you would like, read the reviews, etc.. Once you choose the best gift for you, you can simply click on the box that says "I like this gift" to choose a gift, and then you can enter all of your shipping info to make it easy for the giver to get you your perfect gift! Love it! Now you can buy buy buy to your heart's content, and you know that you are picking a great gift! I absolutely love the whole reverse wishlist concept, and the UR button at the top of my screen keeps me motivated to keep searching for great gifts! Thanks pickURgift for revolutionizing my Christmas! Need even MORE help with your Christmas gift list this year? How would $300 in Amazon credit do for you?? I don't know about you, but I could completely finish my shopping with that!! Enter below! a Rafflecopter giveaway Giveaway hosted by Those Media Girls and pickURgift. No purchase necessary. Open to residents of US only - one entrant per household/IP address. Giveaway ends December 16, 2013 at 9:00 p.m. (PST). All entries will be confirmed by sponsor (pick UR gift). Winner will be chosen randomly by Rafflecopter, and notified via email (wiinner must reply within 48 hours). Prize will be shipped/emailed directly from sponsor. I would like to create wishlists for hubby and my sis.